Delivery Man Is A Must See! Get It On Blu-Ray Now! Some of my favorite childhood memories were when we'd head to my favorite Grandma's house for Holidays. She doesn't like turkey, either, so we'd always end up eating either her amazing, homemade lasagna or a nice, juicy ham. But my Grandma didn't serve just any old ham. No, siree. She would serve the delectable, juicy ham that only the folks at HoneyBaked Ham can provide. This is a brand that my family has loved for many years now. In fact, my Grandma and I were just talking about HoneyBaked Ham, and she told me that she has been head over heels for their hams for the past 40 years or so. When they first arrived in her area, she purchased a spiral sliced ham for a special occasion, and she's been hooked ever since! HoneyBaked Ham is a family tradition, just like my Great-Grandma's Rooster seen here. Ready to win some cloth diapers?? Together with 20+ bloggers and 10 cloth diaper retailers, we are hosting 5 days of cloth diaper giveaways to celebrate the launch of a brand new website, ClothReviews.com! Finally there is a website devoted to consumer reviews on cloth diapers! With extensive search options to help you find the "best" cloth diapers and all kind of nifty features that allow you to submit and read reviews and pictures of hundreds of cloth diapers, Cloth Reviews is an exciting resource for the entire cloth diaper community. 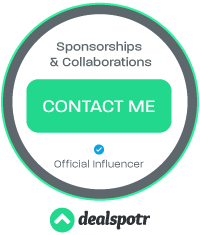 This newly launched site also has a blog review directory, recommended retailers list, and they will constantly be hosting cloth diaper giveaways. Woohoo! To kick start the launch of this awesome new resource for cloth diaper users, we are giving away $700 of cloth diapers and accessories this week! Each giveaway will only last 24 hours so make sure you come back each day to enter! The best part is, there will be 5 WINNERS EVERY DAY! That means you'll have a total of 25 chances this week to win cloth diapers! You can purchase a BayB Brand Bean Bag chair on Amazon for $69.99 plus $9.99 for shipping, as well as on Etsy and eBay. They ship the bean bags in 24 hours and they come filled and ready to use! Be sure to follow BayB Brand on Facebook and Twitter for the latest updates. One lucky reader will win a BayB Brand Bean Bag Chair in his/her choice of color/pattern. This giveaway is open to U.S. residents and will end on 4/14 at 11:59 p.m. EST. Please enter on the Rafflecopter below. The Frozen Bean has an assortment of ice blended coffee, chai teas, creme blends, frullati flavors, carnival blends and base mixes. You are sure to find something you like, wherever you live! The Frozen Bean exports products to more than 40 different countries. The flavor list is expansive. You can't go wrong with flavors like Banana Mocha Latte, Chocolate Cake Latte, Cake Batter, Mint Cookies & Cream, Orange Creamsicle, Southern Sweet Tea and Pumpkin Chai Latte. Many of their latte flavors contain real Colombian coffee to give you a little boost. See more flavors and more about The Frozen Bean here. Be sure to follow The Frozen Bean on Facebook, Twitter and Pinterest for the latest updates and information. Check out the full review of Frozen Bean products at Kara’s Deals & Steals. 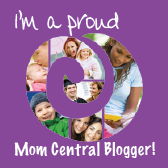 My readers have the chance to win products from The Frozen Bean! One winner will receive a box full of individual flavors to try! This giveaway is open to U.S. residents and will end on 4/14 at 11:59 p.m. Please enter on the Rafflecopter below! Good luck! I don't know about your kids, but mine HATE having to take traditional vitamins. I should even include my husband in this, since he can't even swallow an aspirin without completely gagging. So in my home, any supplement that my family has to swallow is a definite no-go. Of course as a mom, I still want to make sure they're getting all the proper vitamins and nutrients. This is where Superior Source comes into play. This great company offers a wide variety of supplements for the whole family. The great part? They're micro-lingual! What does that mean? Well, they dissolve under your tongue, delivering the vitamins and minerals at rapid speed. I told Sophie and Xander, and they immediately went into party mode. They put on their grumpiest party hats and even some adorable Grumpy Cat masks. How cute are they?! There was a lot of buzz and excitement, and I think our own kitties overheard our plans. You see, they idolize Grumpy Cat like I idolize Bruno Mars, so they were literally flipping out over the chance to celebrate their favorite feline's special day. The kids have convinced us we absolutely need to make grumpy cupcakes. Of course if the kiddos get treats, the kitties should, too. 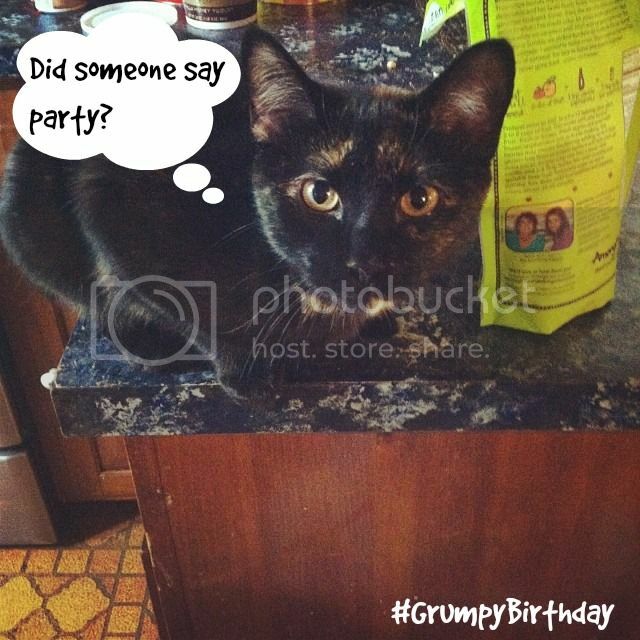 Luckily, our Walmart carries Friskies® Party Mix, which just happens to be our cats' favorite party food. If you'd like to spoil your cats, you can grab your own Friskies® Party Mix at your local Walmart, too! Do you want to help celebrate Grumpy Cat's Birthday in a very big way? 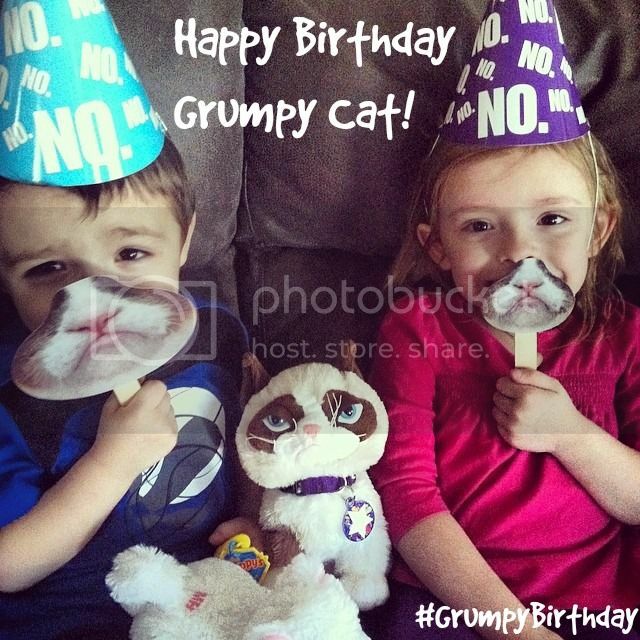 You can enter to win a trip to New York City for Grumpy Cat’s Birthday Party! How cool is that?! To enter, just upload a picture of your cat's best Grumpy Face and be entered to win big! Hurry, this sweepstakes is only open until April 7, 2014! It's no secret that I am a bit of a hippie. At least that's what I am told every single day. I don't mind, though. I love my tie-dye accessories, classic rock, attachment parenting, homeopathic remedies, and organic and sustainably sourced products. If that all makes me a hippie, than I am thrilled to be among the ranks of the enlightened. While trying to conceive my youngest babies, I spent copious hours researching everything from ingredients in food and household products, vaccinations, and everything else a parent could possibly worry about. What I found terrified me....There is SO much poison being pumped into our lives, from the foods we eat to the clothes we wear to the shampoo we use to wash our hair. One of my biggest concerns is definitely the use of GMO's. (Genetically Modified Organisms.) GMO's are typically found in food, in drinks, and even in the cotton used to make clothing. Why is this a bad thing? Well, for one, I don't want to feed my kids "RoundUp Ready" produce. I also don't want their diets to be full of hormones, pesticides and other potentially hazardous substances. So when I learned that the folks over at one of my favorite holistic retailers, ORGANIC INDIA, had just received their Non-GMO Project Certification, I was over the moon with excitement. Something NEW and EXCITING has hit the cloth diaper community, and we are celebrating with a huge cloth diaper giveaway! ClothReviews.com, the ultimate source of consumer reviews for cloth diapers, has just made its debut. 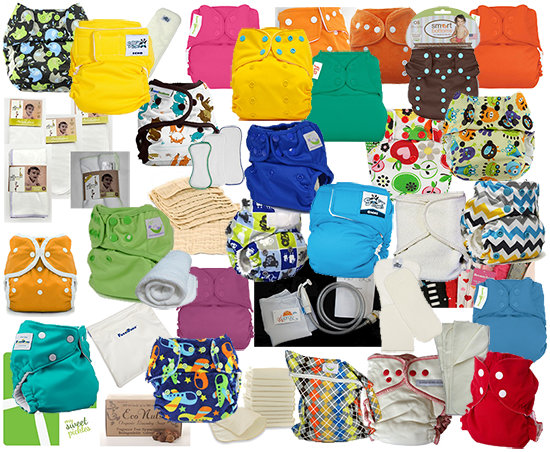 To kick start the launch of this awesome new resource for cloth diaper users, we have linked up with 20+ amazing bloggers and 10 great cloth diaper retailers to give away $700 of cloth diapers and accessories! Woohoo! The event starts on Tuesday! 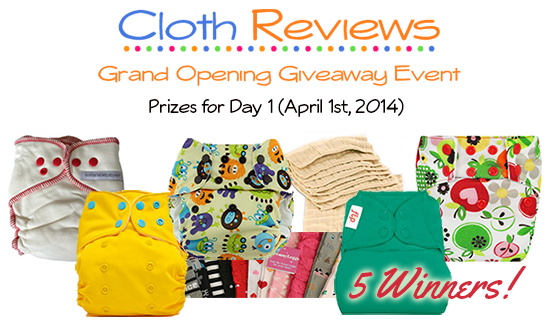 April 1st - 5th we will have 5 days of cloth diaper giveaways. Each giveaway will only last 24 hours so make sure you stop by each day to enter! The best part is, we will have 5 WINNERS EVERY DAY! That means you'll have a total of 25 chances this week to win something fun and fluffy. Anyway, with 2 preschoolers, a messy teenage boy, a husband who is even MORE messy, 4 cats and 3 dogs, there is definitely a lot of cleaning to be done on a daily basis, spring or not. The house, and my babies' bottoms. Pampers wants to help make spring cleaner gentler and easier than ever with their Sensitive wipes. We love these wipes, and use them frequently. While I love my cloth diapers, we never really caught on to cloth wipes. That was a bit more ick than we wanted to have to deal with. So Pampers wipes have been our go-to for quite a long time now. They are extremely gentle on the skin unlike some other wipes, and have never irritated my kids' skin. They really do provide a gentle clean. I received a promotional package of products from Pampers to help make spring cleaning a bit more bearable. Included were some of my current favorites, like the Swiffer Wet Jet and Olay Quench lotion! Also included were some great cleaning gloves, a portable caddy and of course, Pampers Sensitive Wipes!